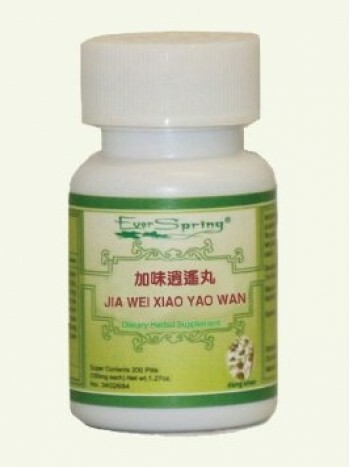 Jia Wei Xiao Yao Wan (Free and Easy Wanderer) disperses Liver Qi stagnation and helps with circulation to regulate menses. Jia Wei Xiao Yao Wan (Free and Easy Wanderer) – 200 ct. Product Code: Jia Wei Xiao Yao Wan (Free and Easy Wanderer) – 200 ct. In traditional Chinese medicine this herbal formula is used to disperse liver Qi stagnation. While studies have yet to fully reveal how it works in modern biomedical terms, researches have suggested that Jia Wei Xiao Yao Wan may regulate menstruation by regulating the secretion of hormones. In a study in which 51 patients were involved, levels of estrogen and prolactin were significantly reduced after use of Jia Wei Xiao Yao Wan, whereas no change was observed in the level of testosterone. . This product is not intended to diagnose, treat, cure, or prevent any disease.